I started hunting and shooting at around age 8 with my family in North Georgia. I can't remember a family get together where at least some time was spent out on our property shooting. In 2009 and I decided to go to my first local IDPA match. After that I was hooked and tried to go as often as I could. It was not until 2013 that I really started to take the sport more serious and devote more time to it. 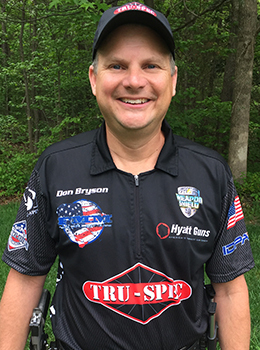 In my first year of competitive shooting, I shot in 6 major tournaments including the US Nationals. I really don't have just one particular favorite shooting memory. Anytime I go practice at the local range and have my kids go and shoot with me is considered a great time. Finish in the top 75 at the IDPA World Shoot in September. Also, plan on crossing over into USPSA and 3-gun.